The Abus new generation of padlocks , strong, lightweight and innovative. TITALIUM is based on a special aluminium alloy, a mixture of materials is created that is extremely durable and lightweight; similar to the process used in aircraft construction. This contemporary product implementation is also reflected in the product design - all the locks in the TITALIUM series feature an impressive stainless steel like finish. 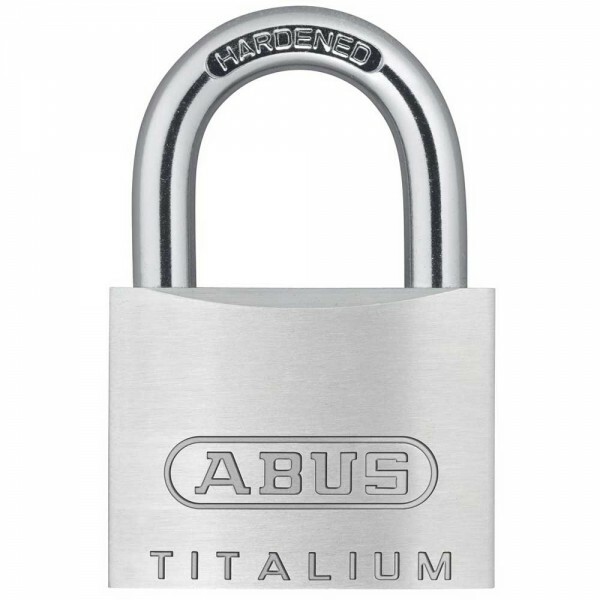 Compared to classic brass padlocks, the locks in the TITALIUM series are around 30% lighter but feature the same level of security making them excellent value for money. The 54TI series is the standard level to the new generation of padlocks. With a TITALIUM? lock body, rustfree internal components and 5 pin tumbler cylinder, a hardened steel double locking shackle, which resists saw attack, they offer optimum security against lower theft risks.